Definition at line 98 of file Gnu.h. Definition at line 100 of file Gnu.h. Does this tool have "good" standardized diagnostics, or should the driver add an additional "command failed" diagnostic on failures. Definition at line 103 of file Gnu.h. Definition at line 104 of file Gnu.h. RenderExtraToolArgs - Render any arguments necessary to force the particular tool mode. 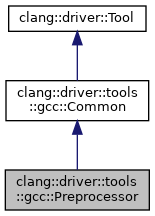 Definition at line 192 of file Gnu.cpp.